Three runners in two states for the stable on Saturday. Vengeur Masque runs at Flemington, Barthelona is at Rosehill and Strike Force heads to Geelong. Vengeur Masque (pictured) contests the Queen Elizabeth Stakes (Gr 3) with Patrick Moloney in the saddle. Unfortunately, the import has drawn poorly - again. “We just can’t draw a barrier which is frustrating,” Mike Moroney said. “Having watched the races this week it does not appear that many have made ground from the back so we would have liked to ride him forward. “There does not look to be a lot of speed in the race but we’re very happy with the horse - he has bounced through his run in the Lexus in great order. Barthelona is in Sydney and runs in race nine, the Show Some Betiquette Handicap over 1300m with Christian Reith to ride. Moroney said Barthelona has arrived at the Sydney stable in great shape. “He’s got there well and his last bit of work before leaving was excellent,” Moroney said. 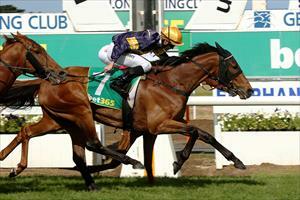 “He looks terrific and has coped with the extra work, he was still a bit immature last preparation. Strike Force has also drawn barrier three in the Ballan Cup at Geelong. Moroney has again taken advantage of Jordan Grob’s claim to reduce Strike Force’s weight. “We’re very happy with him and he has come on for his excellent run first-up at Geelong over a short trip," Moroney said.